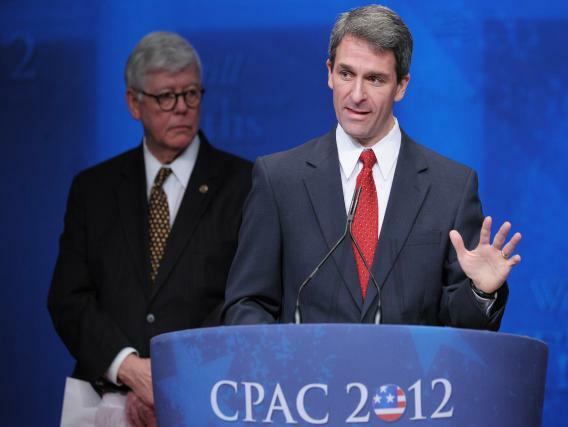 Virginia Attorney General Ken Cuccinelli (R) speaks during his acceptance of the ‘Defender of the Constitution’ award as National Rifle Association President David Keene (L) looks on at the 39th Conservative Political Action Committee February 9, 2012 at a hotel in Washington, DC. Virginia Attorney General Ken Cuccinelli is the GOP’s de facto nominee for governor. If elected, he’ll likely have a Republican Assembly and Senate to work with; as governor of one of the largest swing states (among states decided by fewer than five points in 2012, only Florida and Ohio are larger), he’d immediately become a leading Republican voice. He’s also opposed to the current, localized fad of proposals to split electoral votes by congressional districts.